Who needs a tumbler when you can take a swig out of the Great American Flask by Jacob Bromwell? 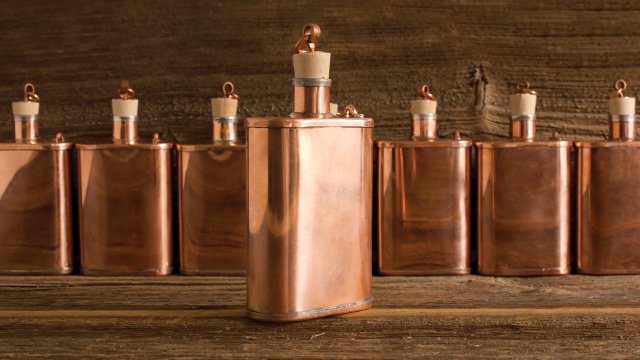 Hand crafted from solid copper, this historically accurate showpiece is soldered by veteran metalworkers and harkens back to pioneer days… when men drank whisky and that was that. I’m a seasonal drinker and while we’re still weathering the last vestiges of winter and cold spring rains shower upon us, there’s no better time to hunker down with a brown spirit that will grow some hair on my chest and warm the blood coursing through my veins. Copper, known for purifying liquids that come in contact with it, has been used in the distillation process of whiskey for centuries. The style of this Jacob Bromwell showpiece could have been found on the old pioneer trails as Americans made their way across unchartered lands. I utilize the flask from the comfort of my own couch. My only question is what to fill it with. If I want to throwback to pre-Prohibition days, I’ll opt for rye, which largely disappeared after the 1920s and has only recently seen resurgence from artisan makers of fine spirits. Rye whiskey must be made from a mash of at least 51 percent rye and aged in new oak barrels. If I had to drown in a vat of rye, I’d pick High West Distillery’s Rendevous Rye. Made from a 95 percent mash rye, the rich amber spirit holds up in mixed drinks and is a powerful elixir on its own. Sometimes my sweet Southern side comes out and I prefer smooth bourbon. A truly American product, Kentucky has a stronghold on the corn-based whiskey and follows a similar distillation practice as rye. While I may be a purist, in the Hudson Made tradition my heart (and my flask) are devoted to Hudson Baby Bourbon, made from 100 percent New York corn. And when I am alone on a gloomy night with no comfort except my dog and my DVR, there is no better soothing spirit than Writer’s Tears. Dating back to the 15th century, Irish whiskey has a long, troubled history and only the strong have survived civil and trade wars. This pure pot still whiskey is made from a mixture of malted and unmalted barley and is unique to Ireland. Best appreciated when writing one’s memoirs or a nasty break-up note, I have found it equally enjoyable while gazing out my window at the New York skyline. To celebrate the launch of the flask, Hudson Made teamed up with New York City cocktail chemist and barkeep-about-town Paul Ammerman to create a drink that brings the Hudson Made philosophy to life. “I decided to incorporate maple syrup into this modern interpretation of an Old Fashioned since we’re at the beginning of maple-tapping season,” says Paul of his creative process. Stir. Serve on the rocks with an orange twist. Need more ideas about how to fill your Bromwell flask? 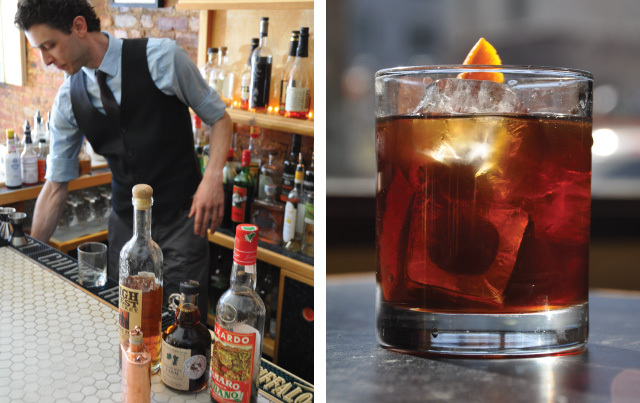 Check out some of my favorite aficionados of ardent spirits at the lifestyle blog Inside Hook. They’ve got the low-down on local whiskies and seasonal cocktails. Now get swiggin’. Matthew Wexler is the National Style and Travel Editor at EDGE Media Network. More of his musings can be found on his blog, roodeloo.com. This post was written in collaboration Sloan Rollins.